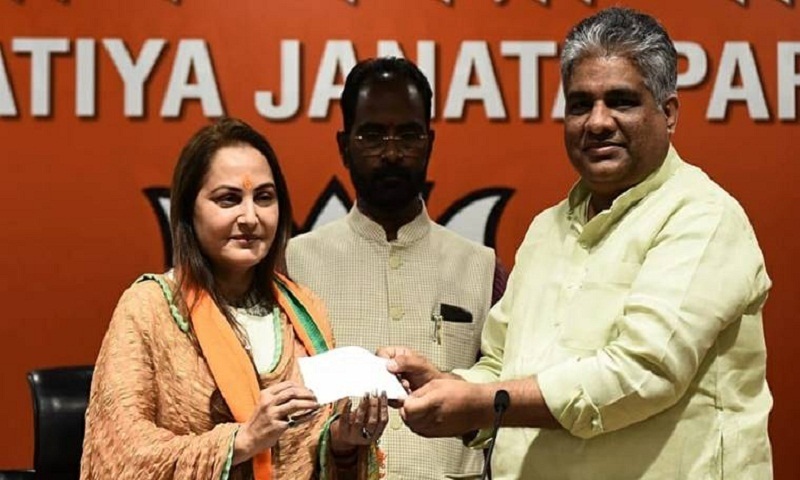 Actress Jaya Prada joined the BJP on Tuesday, fuelling speculations that the party may field her against Samajwadi Party veteran Azam Khan in Rampur, western Uttar Pradesh. Jaya Prada and Azam Khan are arch-rivals and have fought each other bitterly during their stint in the Samajwadi Party. Jaya Prada said she was joining the BJP as she was impressed with the work of Prime Minister Narendra Modi. She said joining the BJP was a key moment in her life. She began her career with the Telugu Desam Party in 1994 and was a member of the Rajya Sabha from Andhra Pradesh. She crossed over to the Samajwadi Party after falling out with TDP chief N Chandrababu Naidu. A close confidant of then Samajwadi Party leader Amar Singh, Jaya Prada successfully contested the 2004 and 2009 parliamentary elections from Rampur. She was expelled from the Samajwadi Party in 2010 for throwing her weight behind Amar Singh in a fight between him and the party leadership. They floated a regional party and contested the 2012 assembly election without much success. Jaya Prada joined the Rashtriya Lok Dal and fought the 2014 election from Bijnor. She stood fourth, report Hindustan Times.